“The darker, the riper,” I was told. I picked up a small box of ’em the other day at one of the grocery stores in my area that I frequently visit. Yep, a box of 15 figs. Don’t they look cool? And there’s one sliced in half so you can see the inside of one (see second photo). Well, just in case you’re like me and hadn’t seen a fresh fig before. I hadn’t. But I’d seen a fig tree once, over 30 years ago – my Italian landlord had one growing in his tiny front yard, where we were living in Little Italy in Toronto (in the vicinity of Yorkdale Shopping Centre). He watched over it protectively. And he had a little veggie garden growing in the backyard. So, I would see him tend to his fig tree and I’d always wonder what fresh figs would taste like. Then two years ago, my friends Susan and Steve introduced me to the most tastiest dried figs I’d ever had – prior to that I’d only had the usual ones at the grocery store. Theirs came from Costco and were packaged in such a way as to be like a snack food (in a resealable bag; and organic). It opened my eyes and taste buds to the world of dried figs. Still, my tummy hoped that one day I’d get to try a fresh fig. So I found myself in Jacquie’s line-up at the Metro with two single figs — I only wanted samplers and I didn’t know if they’d be weighed like other fruits. How lucky that I should have picked her cash to go to, as she immediately helped me correct myself, by telling me that the figs were sold in those small boxes – she might have laughed on the inside, but she sure didn’t let on. Eagerly I ran back to the produce section and picked up the box from whence I had picked those two figs, put them back, and brought the box to the cash. Jacquie then told me how much she loved fresh figs and always enjoyed the season when they’d be in the store. These ones, she said, came from California. She described their flavour to me, which ones to eat first based on their colouring ie. ripeness, and other nifty tidbits. Clearly, she’s a big fan! How could I not enjoy them after all that? I immediately started munching on some on the drive home – and I do find them quite enjoyable and yummy! Soft edible seeds; you can just bite into them like eating an apple – eating everything but the tiny stem at the top. Skin and all. SO good! A cute and tasty chocolate! My sons and I picked up my husband from the airport yesterday. He’d gone to Holland for a fun, week-long trip with one of his cousins and returned with a nice collection of photos as well as some souvenirs and treats for the family. There’s some Dutch ancestry on his side of the family, and we are all big fans of windmills and the beauty of tulips and the fine art of Rembrandt and Van Gogh. He gave us all our individual little milk chocolate windmills yesterday, and so I quickly took some pictures of mine to show you – as they are quite distinct in design – before I gobbled mine up. Haha! Time to make our favourite cookies again! 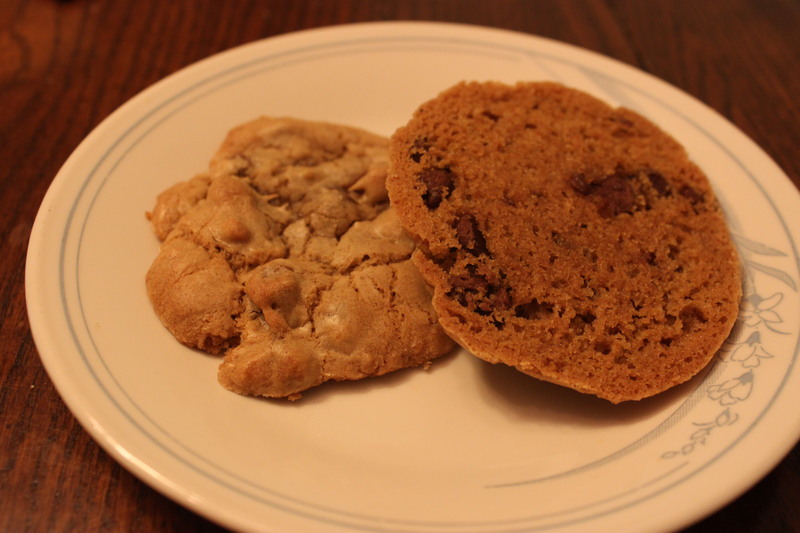 Our late night snacky treat – chocolate chip cookies! They always get gobbled up…and with gusto. 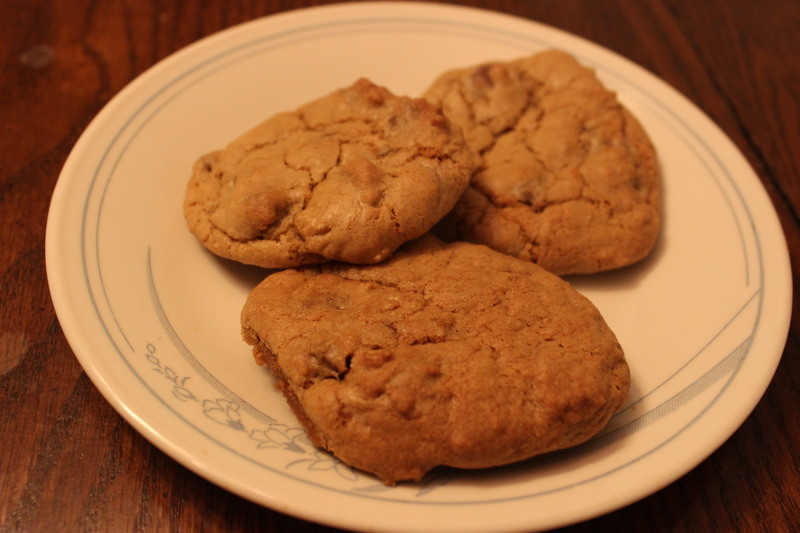 I make them with butter and milk chocolate chips. Bringing with her a surprise….in the spirit of Mother’s Day (last weekend). Goodies and more goodies, including milk chocolate in unusual designs. They didn’t have drums in chocolate, which she hoped to find for me. 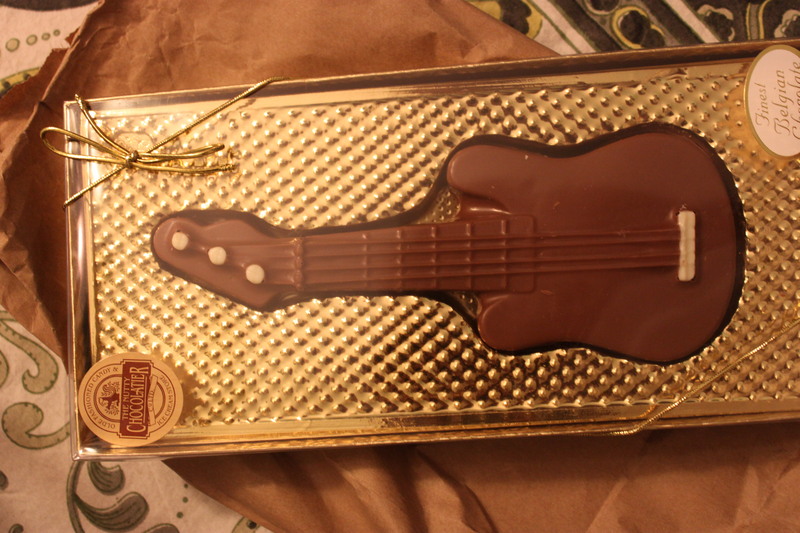 However, there were chocolate guitars! Couldn’t play “Greensleeves” on it….. But yummers! It tasted really good!